Today we face Rayo Vallecano. The last time we played was a 4-0 drubbing with Alexis, Messi, and a certain David Villa all finding the net. That was the last match in which Villa scored before he broke his leg. He is not in the starting lineup to find the net again on his return, unfortunately, but Ibrahim Afellay is on the bench! Yay! 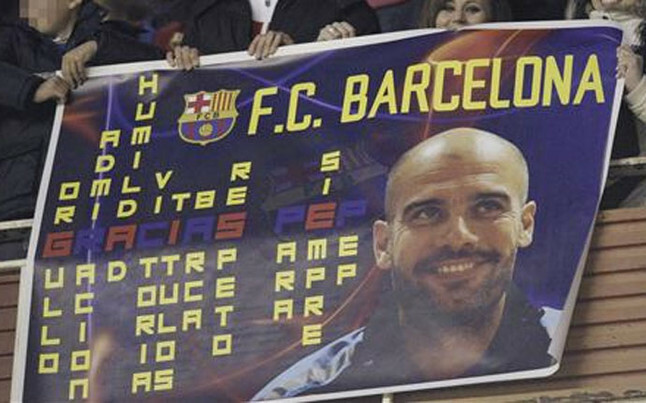 Previous Post Gracies Pep! UPDATED with new video. 2 back from footballing imortatlity! ttyl ladies & gents. My son wants to go kick the ball about. Can’t say no to that. Great game. What a statement from the team for Pep. Great match to watch. No pressure. Credit to Rayo for attacking us and not parking the bus. wut? He was as active as ever! Not in the second half. I saw him talking to Tito a lot but didn’t come out as often. I don’t think he left the bench once during the second half. But it was pretty much over by HT. Not much left to do when we were 5-0 up just after half time. That didn’t happen till the 77th minute. And we know Pep often goes ballistic when we’re cruising in order to correct mistakes he sees. This was a very subdued Mister. Very subdued in the press conference too. But he’s smiling a lot! Sorry, 4-0 just after half time. Apart from a shaky couple of moments at the beginning, I really liked Pinto in the goal tonight. He is very strong in areas in which VV needs to works. Good to see a Barca keeper coming out to punch the ball away from a corner. He’s also very good in communicating with his back line. VV tries to act too-cool-for-school in that area. A couple of great diving saves too. Agreed. His only glaring mistake was that pass in the early first half. Oddly, I felt more comfortable with Pinto in goal. There was a sequence when he spread the ball to his left defender and immediately positioned himself near the goal line. Just to be safe. His Zamora wasn’t a fluke, that’s for sure! Busquets had an ok game tonight, but it was interesting to see the dynamics out there without Xavi and Iniesta, and him playing without them. Busquets is not a fast player – he’s used to holding up the ball and passing to a decision maker like Xavi. Tonight, he was forced to take the ball up and got pinged nearly every time. He was bit out of his comfort zone which is not a bad thing. If Tito had a major say in this line-up tonight, I’d say that there will be a few players re-training their games in the pre-season, and adding more arrows to their quiver of skills. i wasn’t so offended by Thiago and Dani dancing – it just seemed like they were happy, which to me, was welcome after the week they’ve had. i understand why Puyol stopped them, but don’t see exactly why it was such a horrible thing for them to do. the way Dani was booed when he came on was pretty obnoxious – maybe he was responding to that. hmmmm. apparently Guardiola apologized for the dancing celebration in the press conference after the match – is it because they were so far ahead? because i remember Dani and Abi dancing a couple of times when no one made a thing of it. It just demonstrated a lack of respect for the team the were totally destroying. It’s one to over celebrate a match winning goal, it’s another to do it when it’s already 5-6 to nothing. And Rayo fans were fairly respectful to us, with the exception of booing Dani. yeah, i figured that might be it. though it really felt/looked to me like it was the spirit of joy/fun, not arrogance. It seems standard fare when one of our defenders score (Abi, Alves, Adriano) so I wasn’t offended at all. Glad to see Thiago finally score another header, considering all the chances he makes for himself! Oooh! Thiago & Dani were bad boys. Apparantly Pep is pissed at Dani and Thiago’s dancing. He apologized to Rayo fans and said it will NEVER happen again.. I honestly didnt see the big deal but it was HILARIOUS to see them dancing and then Puyi’s boss self cam over and told them to cut it out. LMAO! The control from the ball boy was amazing!!! I’m wondering how many and who we will sell this summer. It is an unusual feeling, one that I haven’t had in a few years. You have to question the players that didn’t make a significant difference this season. Pedro had a stinker, Pique the same but they are obviously staying. Keita had his least productive season, statistically, but he renewed last year. Villa’s injury messed up his season but he’s going nowhere. I can’t see Afellay staying, unfortunately but what does he really offer that Pedro, Cuenca and Tello can’t. On the flip side, Mascherano has been a beast and deserves to be our first choice defender for next season, regardless of the possible arrivals of the Thiago Silva’s of the world. Alexis has been brilliant once he has gotten a run in the team. I have the feeling that Cesc will have a very good year next year and Thiago has been effective in filling in the Xavi sized shoes that neither Cesc nor Iniesta have done. He isn’t as good as either of the others but passes more than they do and keeps the tempo up. When he matures he will be fantastic. – Just a totally different dimension than all three in my opinion. Theres a reason WHY we bought him. It wasnt just cause he was cheap. If he hadnt gotten injured for the whole season he would have been an important part of the team by now. 2 playmakers – Xavi, Iniesta, Cesc & Thiago are all ahead of him. Disagree. Messi, Alexis, Pedrito, Villa, Ibi and Cuenca will be apart of the forward line next season. Tello, as far as I am concerned has not been officially promoted ala Cuenca. Tello may go out on loan or still be apart of the reserve team. How can you say Afellay will be behind Cuenca and Tello? What do you have to go off of? He’s been injured for the whole season HENCE the only reason why we even got a glimpse of Tello in the first place. There were plans for Afellay and now that he’s fit, he will play his part next season. And he can still play in midfield..any position, I think. For one he can play as midfielder.Better long shot.Dutch international.But more importantly, the same way kept Larsson after his injury in his first season and Milito afterwards, it would be un Barca like for me if we to just get rid of a player after a long term injury without giving them a chance to prove themselves again. I dont think the Ibi doubters will get their wish. He’s staying. You can quote me on that. So glad to see him back in action. I dont know if Keita is leaving this summer. I definately don’t want him to. I’m not sure anyone’s leaving, tbh. Maybe Tello may go off on loan and one or two of the B-teamers who will be promoted next season..other than that..
Home from work. Gonna sit down and and watch some footy. Not for the points, not for the table position, not for advancing to the next round of something, but just for the sheer joy of beautiful football (and to laugh at Dani and Thiago being all kinds of naughty— bad Brazilians 🙂 ). Cheers! and, for me even more impressive, on a 35 assists season! This video totally made my day! This video makes me really happy. Guess he used his down-time well! And look at Pedro acting all cool and nonchalant: yeah…I’m back to scoring goals…no big deal, ya know? btw, if anyone knows where to get a ‘Pep tribute t-shirt’, let me know! I already saw black ones with yellow writing in the stands, but I guess they were home-made. that looked made in a barca store – a barca t-shirt with the letters of choice. that must be quite expensive, but i am sure it can be ordered from their online store. Have to agree w/Kimcelona. Ibi going no where. He was just getting games in last year and becoming acquinted w/style and teammates b/4 he was injured. He showed flashes of brilliance last year(the over used Clasico example). He should have the Euro’s to get himself in better condition and I think he’ll add nice depth to our small squad. I guess I can see why the Dani rumours are afloat. He’s at the right age, fully fit, and on form. He’ll probably command the highest price out of anyone we will sell. I don’t want to see him go at all, but if it’s true, we’ll be able to buy a couple really good players with his transfer fee. If it’s true???? Is it wrong that I was thrilled when Pep confirmed that he won’t be managing at all next season? I had that “if I can’t have him then nobody can” sensation that really made me feel like we were in a relationship. It sounds weird, but I know what you mean. Going straight to another club would be disrespectful to Barça. I don’t see him coaching a club in the near future. I’ve heard rumblings about being the next coach for England and I can definitely see that happening because its not a day to day stressful type of job. Punto Pelota had a special on Friday about Pep’s decision and that was one of the hot topics of the evening. I think Pep would go insane managing a national team. It’s true that he isn’t working with the team day-to-day, but I think that would just frustrate him because he likes to control his team in-depth. Also, managing England places you under crazy amounts of media scrutiny, and Pep has enough of that here to last a lifetime. Maybe..but only time will tell what his heart and mind will be set on next. If Pep was able to get through these last two years of crazy then he can get through anything IMO. Englands not going to happen. The FA in England just interviewed Roy Hodgsen. He looks set to get the nod for the job. I could see someplace like Mexico, Qatar, or China happening. I think he’d prefer to escape the intensity of European and Spanish media in a lower-profile position. I’m absolutely confounded and intrigued by the philosophy behind his decision. Does he really want to go for more (because with Barça he’s already reached a zenith)? I’m not sure. The culé in me wants him to take a year off and then return to Barça doing very secretive work in the laboratory where we breed the players from la masia. I guess I can hope. During his sabbatical, I want him to write for El Pais. His old articles on that site are fantastic read. That was fun. Messi looked like he was having a blast. Must be nice not to have the weight of the world on your shoulders. Grateful for one more thing. Our win means that Athletic Club won’t have to do a pasillo, right? Would’ve hated to see that. This is probably the best English article about Pep (imo). Great insights on Pep’s view of football. Also, the blog is really good. One of the few offside blogs that I really enjoy reading. Lovely article, thanks for sharing!